Are too many students going to college? The Chronicle of Higher Education ran an article asking Are too many students going to college? Having recently taught some large lecture classes in physics for non-scientists, I am quite interested in this question. 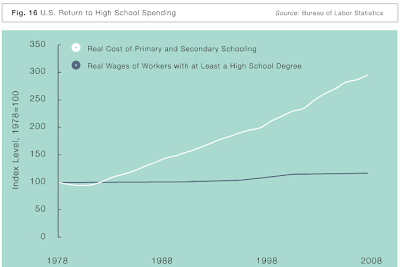 For related discussion, see Higher education and human capital. Here are some answers provided by Charles Murray, our favorite education curmudgeon, to the questions asked in the article. Who should and shouldn't go to college? Charles Murray: It has been empirically demonstrated that doing well (B average or better) in a traditional college major in the arts and sciences requires levels of linguistic and logical/mathematical ability that only 10 to 15 percent of the nation's youth possess. That doesn't mean that only 10 to 15 percent should get more than a high-school education. It does mean that the four-year residential program leading to a B.A. is the wrong model for a large majority of young people. Economists have cited the economic benefits that individual students derive from college. Does that still apply? Murray: A large wage premium for having a bachelor's degree still exists. For everything except degrees in engineering and the hard sciences, I submit that most of that premium is associated with the role of the B.A. as a job requirement instead of anything that students with B.A. 's actually learn. The solution to that injustice—and it is one of the most problematic social injustices in contemporary America—is to give students a way to show employers what they know, not where they learned it and how long it took them. In other words, substitute certifications for the bachelor's degree. Who should pay for students to attend college? Murray: Ideally, students themselves. If that means delaying college for a few years to save money, so much the better—every college professor has seen the difference in maturity and focus between kids straight out of high school and those who have worked or gone into the military for a few years. The ideal is unattainable. But somehow we've got to undermine the current system whereby upper-middle-class children go to college without having to invest in it. I particularly like the comment below from an insightful (see, especially, his comments on calculus) UT Austin student (Plan II?). Too many are attending and I agree full-heartedly with Mr. Murray that only 10% of college-aged individuals should be attending University. I saw firsthand the results of this phenomenon deeply entrenched in the lecture halls of my particular University and was perplexed at the levels of incompetence and lack of passion towards subject material shown by many of my fellow students. I wondered if anyone else shared my particular insights and was relieved to find Mr. Murray and his supporters waiting for me with open arms, telling me, "you are not alone". I don't doubt the value of a hard science or engineering education, the students who remain in those fields are for the most part, fairly smart, and whose work and learning will benefit our society. (Though there are too many unqualified individuals who think being a doctor is a cool and easy job where you make a lot of money with little work) Those students are quickly weeded out, as should be. But in the less challenging fields such as most of the liberal arts, business, communications, I found the lack of intellectual spirit in my fellow students disturbing. The most common responses I encountered when asking about their choice of major and their reason for being at this particular school, their responses were as follows. Degree=Good Job. Football! (a valid point, as our team is the underdog this year in the BCS Championship game). Party=Drunk=Its COLLEGE!. Not one intellectually stimulated response about the faculty and resources offered by one of the top research universities in the nation. They had no passion for their subjects, they waltzed into class with glazed eyes, and danced out with a degree. Most have never checked out a book from the library. Spark-notes are their best friend. I was stifled by the inadequate writing ability of many of my peers when I reviewed and edited their papers. Some of them could not even write at a middle school level, much less a college level. At a top 50 University, nonetheless. I can't even begin imagine how it is at lesser schools. An unfortunate trend at my University is that a great majority of students will choose their classes simply based on the "logic" of pick-a-prof and grade distributions. The most popular ones are the ones that give lots of A's. Few are actually interested in the topic of choice, and the unlucky ones get dropped into hard classes they don't want, skulking, sleeping, or skipping class entirely stifling the learning environment of people who are actually there to learn. Its also sad for Professors as well, because the truly excellent ones are browbeaten and criticized for their inability to gift A's onto undeserving students. Grade inflation is through the roof here. I went to a challenging prep school where my best writings and most carefully thought out essays would usually only earn me high B's, with the occasional A. I thought University would be a challenge, but to my dismay, it has been anything but. I realized it when I quickly spat out some honestly dreadful essays for Philosophy and English Literature because I was in a rush, only to be rewarded with a sparkling 100 and rave comments. Really? Easy A's. Though according to most of my fellow students, these classes were incredibly difficult, the TA and professor were unfair graders, gave out too much reading, etc. Horrifying. In Mathematics and Quantitative sciences it is the same story, though even our "honors students" seem ill prepared to handle the rigors of college level mathematics. Calculus is dumbed down so that the regular student can succeed. But even then, its still widely failed class even in its simplified state But that bodes ill, many people can "do" calculus, but few can understand its implications and applications. I can "do calculus" in the terms that I can memorize the concepts, complete practice problems, and repeat the ordeal on the test. But I can only apply its implications to the simplest of physical and economic problems. I'm not good enough to really UNDERSTAND calculus. I know that. But my ability to "do" calculus earns me an A+ at this University. And it really should not. Too many kids are at college wasting their time. They are not happy with their studies, not happy with the debt they are piling on their heads to attend, but happy with the football team, and the plans for the weekend. They are here for the wrong reasons. In physics 101 last quarter I gave A's or B's to almost 60 percent of the class, which I regarded as very lenient grading. (I guess if this were Brown or Stanford I could have given all A's with just a few punitive B's for the laggards at the bottom ;-) But nevertheless I had to field dozens of emails from aggrieved students complaining about their "low" grades! It makes me wonder whether everyone else (i.e., other professors, high school teachers, etc.) is engaged in grade inflation? It's certainly the easy way out -- I'm sure you get higher student evaluations if you tip off during the term that you're an easy grader. Who is holding the line? Americans paying more to live longer. 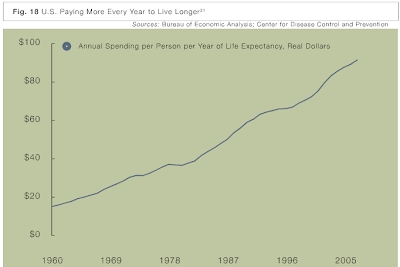 Per capita annual health care costs in 1960 were $1000 (real dollars) and life expectancy 70 years. Today per capita annual health care costs are $7000 and life expectancy 79 years. Many (most?) Americans are rich enough to willingly pay an extra $6000 each year (a total of over $400k!) for an additional decade of life expectancy, but it's not exactly an impressive result for 50 years of health care innovation. Who is shaping the future? 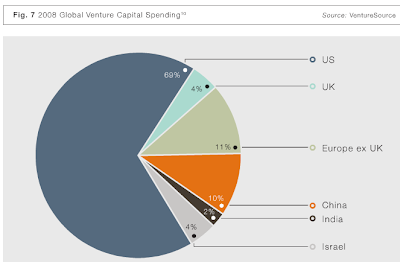 Global venture capital investment is dominated by the US, with China almost equal to Europe ex-UK. Israel is tied with the UK and leads on a per-capita basis. What is the worst case scenario for China in the next 10-20 years which has at least a 10 percent likelihood? The respondents included professors, engineers and government officials. Interestingly, no one I asked mentioned social or environmental or economic collapse, or even conflict over Taiwan. More than one person did mention the possibility of trade conflict leading to runaway nationalistic response. But if that's the worst case scenario, I consider the future pretty bright. One particularly insightful analysis from a Harvard-trained Tsinghua professor described the present Chinese system of governance as favoring stability and slow change. He noted that leaders, both at his university and within the central party, are elected by vote in a process involving numerous stakeholders. (The mechanics of this voting process, while apparently strict and rule-based, is kept secret from the general public. 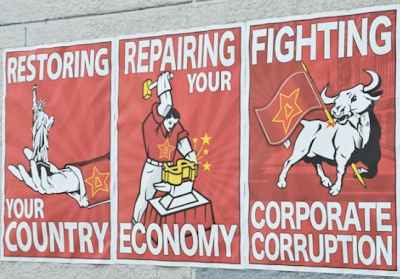 Exactly how this system evolved into being over the last 30 years was unknown even to our analyst, but it's easy to imagine that a system favoring stability would have been favored by people who clearly remember Mao and the cultural revolution.) The stakeholders represent a broad spectrum of interests, including those of retired former officials and, in the case of his university, prominent former professors and administrators. To avoid a veto from any particular interest group, leaders tend to favor consensus and to eschew extreme positions. Significant change can only occur after consensus emerges among a substantial majority of stakeholders. A consensus-driven system will tend to allow rather obvious problems to get out of hand, at least for while. If addressing the problem requires a significant policy shift, then action has to wait until essentially everyone agrees on both the problem and the solution! It's plausible to me that this governance model is consistent with recent Chinese actions (or inaction) related to the urban-rural divide, pollution and the environment, and (gulp!) dollar reserve accumulation. Nothing happens for a long time, but then, suddenly, policies can shift radically. This sounds unwieldy, though grappling with obvious but difficult problems isn't exactly something that our own system has been good at recently -- see, for example, fiscal deficits, health care, financial regulation, income inequality, energy policy, etc., etc. For related discussion, see Is there a China model? What is the entropy of the universe? Abstract. Standard calculations suggest that the entropy of our universe is dominated by black holes, whose entropy is of order their area in Planck units, although they comprise only a tiny fraction of its total energy. Statistical entropy is the logarithm of the number of microstates consistent with the observed macroscopic properties of a system, hence a measure of uncertainty about its precise state. Therefore, assuming unitarity in black hole evaporation, the standard results suggest that the largest uncertainty in the future quantum state of the universe is due to the Hawking radiation from evaporating black holes. However, the entropy of the matter precursors to astrophysical black holes is enormously less than that given by area entropy. If unitarity relates the future radiation states to the black hole precursor states, then the standard results are highly misleading, at least for an observer that can differentiate the individual states of the Hawking radiation. Sorry for the lack of posts -- I just returned from China, where blogging had to contend with the Great Firewall and a busy schedule. Below are some pictures from the trip -- click for larger versions. Our "expedition" was led by a world famous Harvard mathematician, and included professors of economics, statistics, computer science and physics. The opportunity: to create a social science institute to observe and model the Chinese economy in real time using massive electronic data sets. 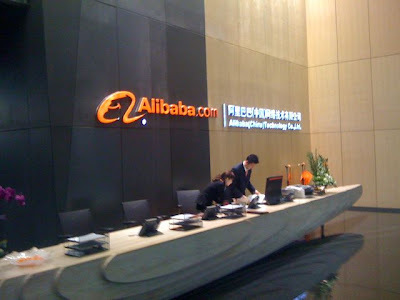 Alibaba Group Headquarters in Hangzhou. 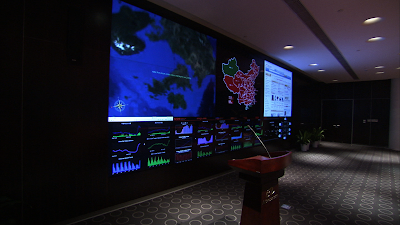 I'm under NDA so I can't say too much, but the Alibaba Group is an impressive set of companies. The transaction volume on their Taobao (EBay-like) C2C site is estimated at around 2 percent of all retail sales in China this year, and should reach 5 percent within a few years. There are roughly 150 million users and 400 million items listed! All of the university students we met were Taobao users and many said it was their preferred method of shopping. 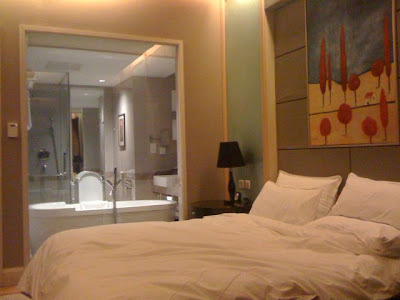 Beijing: Wenjin Hotel in Tsinghua University Science Park -- next to Google China and Microsoft Research. 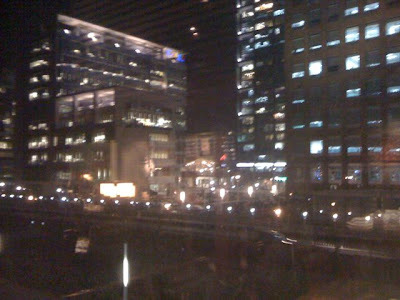 If you squint you can see the Google logo in the picture below. 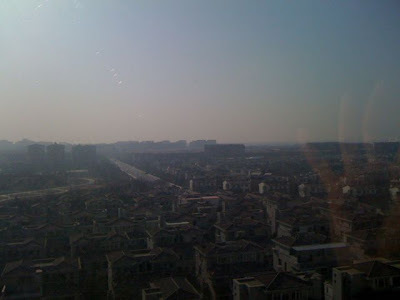 It was cold and windy in Beijing, but as a consequence we had sunny days with little noticeable air pollution. 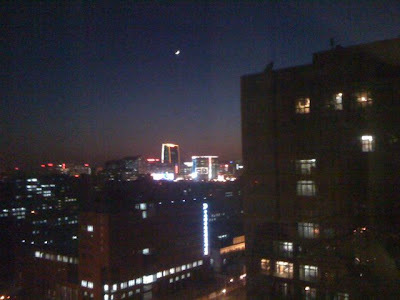 (See here for an air quality Twitter feed from the US embassy in Beijing. We did indeed have good air during our visit.) Traffic is, however, horrendous! 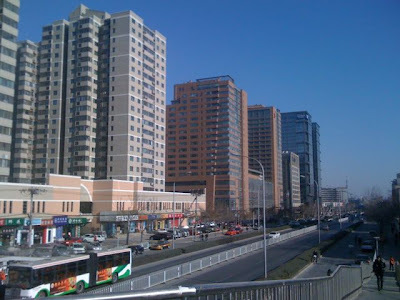 Our hotel was in Zhongguancun, the Silicon Valley of China, which includes the top two universities: Beijing University (Beida) and Tsinghua University. The leader of our expedition presided over the opening ceremony of the Tsinghua Institute of Mathematical Sciences. The hotel was crawling with world class mathematicians! 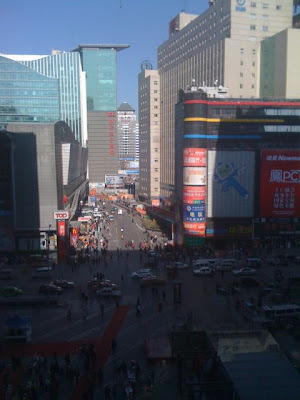 Below is a picture taken in the immense consumer electronics market in Zhongguancun, about a 20 minute walk from our hotel. Enter any of the buildings in this area and you'll be confronted with an army of salespeople trying to sell you laptops, cellphones, etc. Ministry of Commerce. 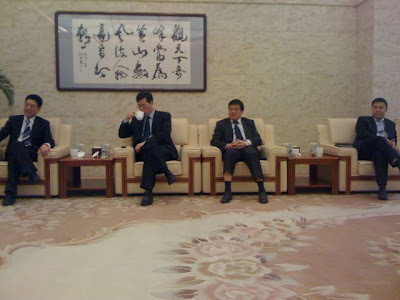 This meeting took place in a less affluent region of south Beijing where locals still burn coal for heat. For this reason, and because the region is in a slight valley, they tend to have a few bad air days a week, including the day of our visit. I could smell a distinct sulfurous odor in the air, and my eyes stung. The air quality provided a jarring contrast to the opulent surroundings at the ministry. 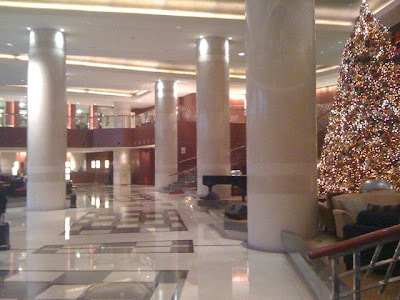 During a night off from lavish banquets and dinners in private dining rooms, I managed to meet with blogger maoxian, an expat Beijinger with a lot of insight about life and business in China. Many scientific entrepreneurs reject any notion that the transformation of knowledge into material products or marketable services is any less intellectually demanding, or that it requires any lesser degree of intelligence, than so called pure science. ... The problems may be diffusely framed -- how to raise finance, recruit and motivate people, organize the corporate environment, locate markets and identify competitors -- but, because of that, they can plausibly be seen as more intellectually demanding than the well-framed problems of academic science. Entrepreneurs may see themselves as having a broad vision of the world, contrasted to the narrowness and inwardness of their purely academic colleagues. They know how to do things about which their colleagues are clueless. It's a matter of experience, of course, but it may also be seen as a form of constitutional intelligence. While I can't help but like this paragraph, I do think we should distinguish between intellectual ability and other sorts of abilities. Scientists who start and run companies may have a broader set of skills (leadership, negotiation, risk taking, communication, psychological insight, etc.) than the typical academic, but I wouldn't describe running a startup as more intellectually demanding than pure scientific research (at least not theoretical physics!). The evening began ominously. Dyson had a stomach bug -- he declined to eat anything at dinner, and made several emergency trips to the bathroom. After dinner he fell asleep on a couch in the physics building. Facing a packed auditorium, with people sitting in the aisles and filling an adjoining overflow room with video monitor, the other organizers and I decided that we'd offer Freeman the chance to call the whole thing off when we woke him up. Luckily for everyone, he felt much better after the nap, and was obviously energized by the large and enthusiastic crowd. After we finished the Q&A, he turned to me and said "Well, your questions cured my bug!" The questions we asked are listed below. You'll have to wait to watch the video in order to hear the answers! You write that scientists come in two varieties: hedgehogs and foxes. Foxes know many tricks, hedgehogs only one. Which kind of scientist makes the most important discoveries? Of course, molecular biology was being born at that moment. But you advised Francis Crick, while he was still a physicist, that moving into biology might be premature. He didn’t take your advice did he, and a few years later he helped discern the structure of DNA? Mistake on your part? You wrote that since childhood, some part of you had always known that the “Americans held the future in their hands and that the smart thing for me to do would be to join them.” Was that why you made your home in America? Do Americans still hold the future in their hands. In the 50s, many people were fascinated with the potential of nuclear energy. Admiral Lewis L. Strauss, then Chairman of the U.S. Atomic Energy Commission, when he said: "It is not too much to expect that our children will enjoy electrical energy in their homes too cheap to meter." Did you share this excitement? There were plans to build a nuclear airplane that would fly for a year at a time and you got involved with a nuclear rocket project-- the Orion Project. Tell us about that. Weren’t you involved in the project’s demise—the test ban treaty? Now about the nature of science. You write, “Science is an art form and not a philosophical method. The great advances in science usually result from new tool rather than from new doctrines.” Could you elaborate? Physics leads to some pretty weird places. 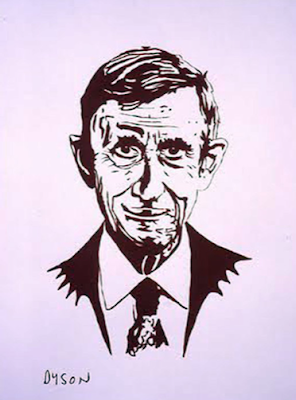 You were at Princeton when Everett proposed his "Many Worlds" interpretation of quantum mechanics. Could you describe the reaction to his ideas then (including your own), and your present opinion? It’s been said that Quantum Electrodynamics or QED is the most successful theory science has ever produced, having been verified in some cases to an accuracy of 12 decimal places. It was worked out by two geniuses, Feynman and Schwinger, but their theories looked totally at odds—one used diagrams the other formal analysis. In perhaps your most celebrated piece of physics, you showed they were equivalent. I’m curious, did Feynman and Schwinger grasp immediately what you had done? You write, “Heretics who question the dogmas are needed... I am proud to be a heretic. The world always needs heretics to challenge the prevailing orthodoxies.” Do we need more heretics today? From science fact to science fiction. 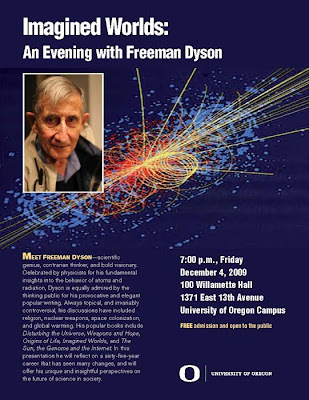 Your speculations about the future of humanity include the Dyson tree and the Dyson sphere. A Dyson tree is a genetically engineered plant capable of growing on a comet. You think comets are promising places for life..how so? You've proposed that genetic engineering might be used for many purposes, from green energy to adapting humans for life in space…even to people growing their own dogs. Please tell us more. What about engineering ourselves for greater intelligence; could that be the next leap forward in human evolution? 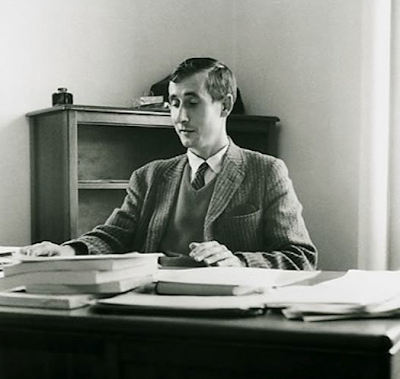 Jacques Hadamard said “It is important for him who wants to discover not to confine himself to one chapter of science, but to keep in touch with various others. ” Have scientists and mathematicians seized or squandered opportunities to learn from others in different disciplines? To what extent should the public's view influence the path of science? As a great observer of science, you’ve seen how science can evoke excessive hype and fear….has the negative public reaction to things like nuclear energy, GMOs, nanotechnology…has this surprised you? Science and religion. There are scientists, like NIH chief Francis Collins, who believe in God and think religion is compatible with science. There are scientists, who are what you call passionate atheists—Hardy, Erdos, Dawkins, who think religion is a massive irrational distraction. You say that religion must be explored from the inside and those atheists, even very smart philosophers like Dan Dennett, will never understand it. How so? In 2000, you were awarded the Templeton Prize for Progress in Religion. You wrote, "I am neither a saint nor a theologian. To me, good works are more important than theology." What did you mean? We’ve spoken about science and religion, let’s end talking about technology. You write, “Technology is a gift of God. After the gift of life, it is perhaps the greatest of God's gifts. It is the mother of civilizations, of arts and of sciences.” In your lifetime, those gifts include biotechnology, computers, and the Internet. What gifts might lie in our future? What would you be working on today if you were 25 years old? I will report the answers to some of my dinner questions. About Dirac and the path integral, Dyson thought that Feynman's story was probably true -- Dirac did not know that the quantum amplitude and the exponential of the action were more than "analogous" (indeed, they are proportional) until after Feynman had worked it out. It was also Feynman who had the idea of the sum over classical paths. In Dirac's paper the exponential of the action might have been a quantum operator, like the time evolution operator, which is the exponential of the Hamiltonian. F: Did you know they are proportional? I got this email message today. Again, I haven't done my homework on this issue, so I don't have a strong opinion. But the signatories to this email and (I suspect) a fair number of APS members do. By now everyone has heard of what has come to be known as ClimateGate, which was and is an international scientific fraud, the worst any of us have seen in our cumulative 223 years of APS membership. For those who have missed the news we recommend the excellent summary article by Richard Lindzen in the November 30 edition of the Wall Street journal, entitled "The Climate Science isn't Settled," for a balanced account of the situation. It was written by a scientist of unquestioned authority and integrity. A copy can be found among the items at http://tinyurl.com/lg266u, and a visit to http://www.ClimateDepot.com can fill in the details of the scandal, while adding spice. If you believe that the APS should withdraw a Policy Statement that is based on admittedly corrupted science, and should then undertake to clarify the real state of the art in the best tradition of a learned society, please send a note to the incoming President of the APS ccallan@pr****ton.edu, with the single word YES in the subject line. That will make it easier for him to count. Be sure to look at the hundreds of comments! Tierneylab: ... I’m not trying to suggest that climate change isn’t a real threat, or that scientists are deliberately hyping it. But when they look at evidence of the threat, they may be subject to the confirmation bias — seeing trends that accord with their preconceptions and desires. Given the huge stakes in this debate — the trillions of dollars that might be spent to reduce greenhouse emissions — it’s important to keep taking skeptical looks at the data. How open do you think climate scientists are to skeptical views, and to letting outsiders double-check their data and calculations? Very few of the people with strong opinions on climate change have done the homework I refer to -- read the literature (including arguments on both sides), look at the data, etc. In the case of the housing and credit bubble I did do the homework and as a result I thought we were in a bubble back in 2004, that credit derivatives were dangerous, and that it might end badly. I can say something with very high confidence: scientists are not immune to groupthink! This is turning into a bit of a production -- 4 HD cameras and professional editing will hopefully result in a nice documentary video. Click for larger version of poster.